Quick Connect is a feature that allows you to easily search and connect to nearby devices for convenient file sharing or use your GS5 phone as a remote control by connecting it to a smart TV. In order to successfully share contents, the device to connect must have Quick Connect support. Also make sure Quick Connect is enabled on the device to avoid any further issue. Devices that do not support Quick Connect must have Wi-Fi Direct or Bluetooth enabled to share files with the GS5. How to Connect GS5 to nearby devices with Quick Connect? 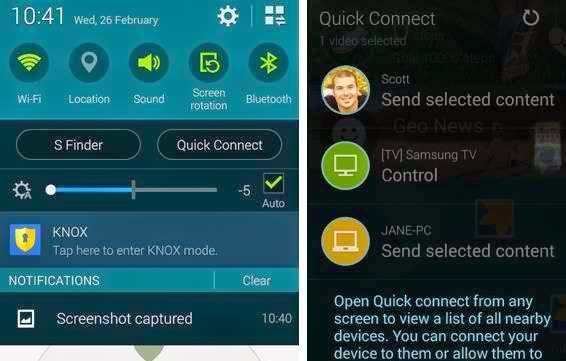 Follow these steps to use Quick Connect to connect your Galaxy S5 to other available devices nearby. 1. Open the Notification Panel on your device by swiping your finger from the top of the screen. 2. Touch Quick Connect. Doing so will automatically enable Bluetooth (if still disabled). Hint: Quick Connect location may vary depending on your carrier. It may be listed in the Quick Panel or under it. 3. Locate and touch the name of the device you wish to link with your GS5 and send file(s) to. 4. Choose which type of file or content you want to send to the other device. 5. After choosing the folder/album that contains the file you want to send, touch to select that File. 6. Touch Done to proceed. Hint: If this is the first time you send a file to the connected device, you will be prompted with the messages: "Waiting acceptance..." and "GS5 wants to share 1 (file type to share) with you." 7. When prompted with the aforesaid notice, touch the Accept button to accept the file. This will initiate file transfer in both devices. 8. When the device starts to receive the files, you will see another prompt saying, "Receiving files from (source_name). Check progress in notification bar." In this case, you will need to use and enable Bluetooth function on your device. 1. Open the Notification Panel by swiping your finger down from the top of the screen of your GS5 smartphone. 2. Touch and hold Bluetooth to proceed. 3. Touch to enable Visible to all nearby Bluetooth devices option. 4. Touch to select the name of other nearby device you want to pair with your GS5 for file sharing. 5. Confirm pairing request by touching OK on both devices. Doing so will let you instigate sharing of content(s) with the paired device through Quick Connect. How to Connect via Wi-Fi Direct? 1. Open the Notification Panel by swiping your finger down from the top of the screen. 2. Touch and hold Wi-Fi. 3. Touch More Options to continue. 4. Touch to select Wi-Fi Direct. 5. Touch the name of the available device you want to pair with your GS5. 6. Touch Connect on the Invitation to Connect dialog prompt on the device you want to pair with to allow connection between devices. Doing so will also let you use Quick Connect to share file(s) with the paired devices. Touch End Connection to stop connection between devices.